For our latest distribution, Byte holders can receive rewards just for holding Bytes. 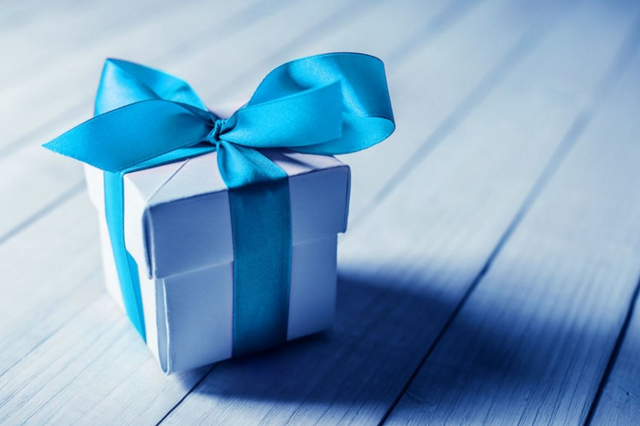 Distributing funds again to existing Byte holders has been a popular request in the community for a while, and we are pleased to bring it back. This time with an improved format! Every week, we will airdrop a prize of 200 Gigabytes (GB) and 422.22 Gigablackbytes (GBB — the private currency) to a single winner. It is like a lottery, but you don’t need to buy a ticket, just prove your existing balance. Your chances to win depend on the balance of the addresses you link. The larger the balance, the more points you get. The winner of the draw will be selected randomly on a specified date/time in a provably fair way (for the techies, see the algorithm we use to select the winner, it is based on randomness derived from the latest Bitcoin block). Your chance to be selected depends on the points you have on that date/time. The more points you have, the higher is your chance to win. We have designed the rules to favor of participants with smaller balances, so larger balances don’t result in lots of additional points. This is in keeping with our aim since day 1 to get Bytes and Blackbytes into the hands of as many different people as possible. To get the most points, you’ll need to pass real name attestation and prove your real name (it is a paid service and to pass the attestation after the first attempt, make sure you have good lighting conditions, good focus, and no glare when you scan your document). The draw bot doesn’t see your personal details, it needs just the fact that you are attested. Real-name attested addresses get 1 point per GB of balance up to 10 GB and additionally 0.1 point for each GB above that. Unattested addresses get 0.1 point per GB of balance. 0.1 point is awarded for each GB of balance increase since the previous draw. 0.2 point is deducted for each GB of balance decrease since the previous draw. Increase your chances of winning by referring new users. When you refer new users to the draw and one of them wins, you also win 100 GB and 211.11 GBB! You get your referral code and instructions after you link your own address. How long will this distribution last? We plan to run these draws weekly. There is no specified end date but we hope to run the draws for at least 6 months. Needless to say, the weekly draws cannot last forever (only 1 million GB of Bytes and 2.1111 million GBB of Blackbytes will ever exist). This is a new distribution format that to our knowledge has never been tried before and we can’t be sure that we made no mistakes in designing these rules. Based on experience from previous weeks, we’ll adjust the rules of the draw, the amounts paid, points per GB, etc. 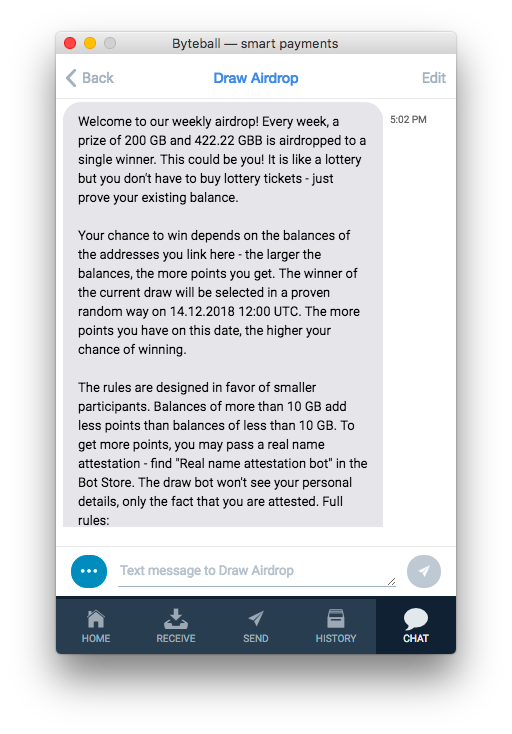 Add the Draw Airdrop bot from the Bot Store inside your Byteball wallet and follow the instructions. Good luck! See the currently linked addresses (including yours) here http://draw.byteball.org. Your UA account score is currently 5.895 which ranks you at #350 across all Steem accounts. In our last Algorithmic Curation Round, consisting of 184 contributions, your post is ranked at #136.